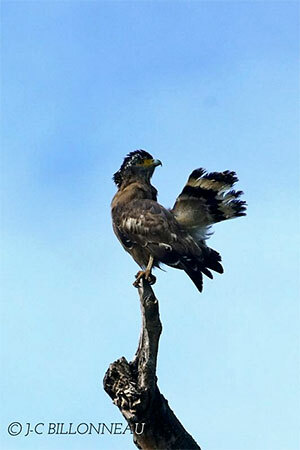 Crested Serpent-Eagle is rather a medium-sized raptor, often seen soaring above forests. Adult male has brown plumage. Upperparts are dark brown, with several fine white spots, mainly on wings and scapulars. Wings are relatively short and broad. Underparts are slightly paler, almost pale reddish-brown. Breast is finely barred with dark brown. Rest of underparts is spotted with white. Underwing coverts are pale brown. Tail and underside of flight feathers are black, with broad white band. Head is dark brown, with thick crest on nape. This crest is brown, finely barred with white. Hooked, strong bill is black with yellow cere. Eyes are yellow. Legs and feet are yellow. Juvenile has whitish head, underparts and underwing. We find numerous subspecies which differ in size and colour. Crested Serpent-Eagle feeds mainly on reptiles such as snakes, lizards and frogs. It also consumes small birds, small mammals such as mice, and large insects. 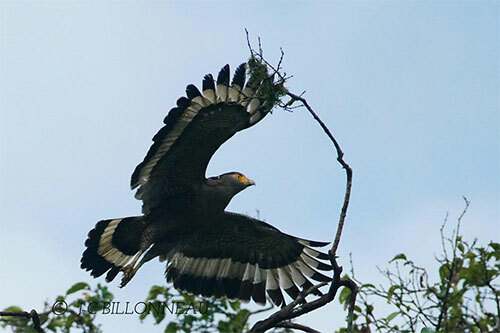 Crested Serpent-Eagle is vulnerable to disturbances in its habitat, and some populations are threatened. However, the species is widespread and even abundant according to the location. Crested Serpent-Eagle utters shrill call, a strident prolonged whistle “iluii…kii-kii-kii-kiiluii”, carrying far away. Call is like Handpump noise, used in Village to draw Water from Subsoil\Underground. It calls mainly while it is rising on thermals in the morning. 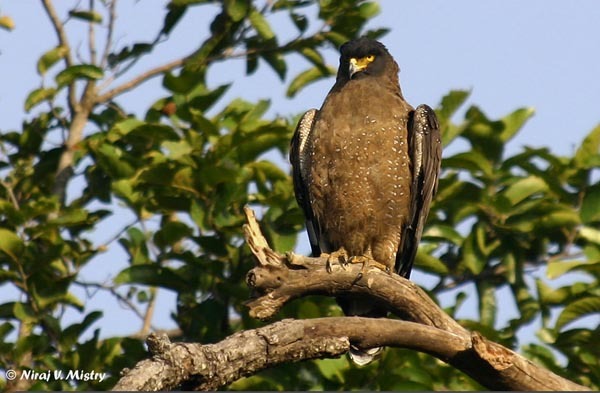 Crested Serpent-Eagle lives mainly in all kinds of dry or wet forests, mangroves and scrubs. It is resident for low levels up to 1900 metres. 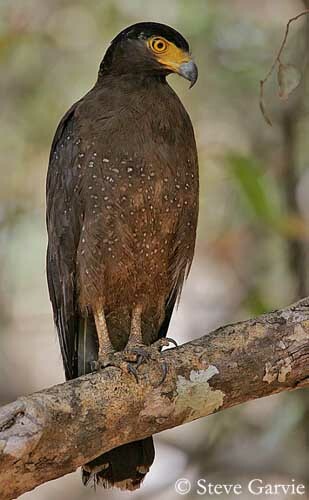 Crested Serpent-Eagle breeds in southern Asia, from India and Sri Lanka to south China and south-east Asia and Indonesia, and in the Philippines. Crested Serpent-Eagle hunts from a high perch at clearings’ edges. It watches for prey, motionless during long moments at tree top, with flat crest. When a prey is located, it drops almost vertically, and it catches arboreal snakes, reptiles, small birds and mammals. It takes its preys on the ground, and also takes dead snakes when it finds one. Crested Serpent-eagle is usually solitary, and resident in its range. Pairs stay together all year round, and may hunt and soar together over the country. It raises its crest if alarmed. Courtship display usual form is soaring with noisy calling. Another display shows the eagle stopping and rolling, with half-closed wings and raised tail, with wings rapidly vibrating or shivering. Crested Serpent-Eagle is able to twist and turn easily, while chasing prey at high speed among trees. It is often seen soaring over treetops in the morning, enjoying warm thermals for rising in the air. It is a very good flier. 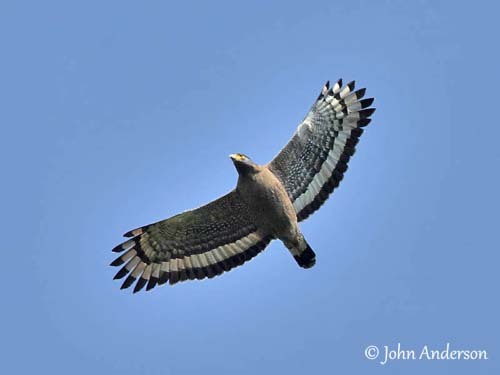 When it soars, broad wings are held in shallow V.
Crested Serpent-Eagle uses the same territory year after year, and nests in the same site, but maybe not in the same tree. Nest is relatively small, made with sticks. Interior is lined with green leaves. It is situated at treetop, at about 6 to 20 m up or more, and often near water. It is built by both adults. Female lays only one egg, and breeding season varies according to the place. Incubation lasts about 35 days, by female alone. During the first days after hatching, young is brooded by both parents, and later, it is left for long periods. Feathers appear at about 21 days, through the down. At one month, it can stand well, and it is mostly covered with feathers. It can perform its first flight at about two months after hatching. It is fed by both parents, mainly by male which brings prey. Female remains near or on the nest; sometimes she shades the young from the sun. First preys are in small pieces, but young can feed itself very soon. After fledging, young may be seen soaring with adults, and it probably depends on them for some weeks more.